I posed a question to my facebook friends the other day. One friend stated that they didn’t believe insects had feelings or emotions. Another friend said that any living thing can sense an energy – good or bad. She went on to say that living with three dogs she adores (and finds amazing), she feels a greater awareness and a connectedness to, and interest in ‘life’. She even removes crickets from her teaching room at school. Yet another friend commented “I feel that insects, like animals, can’t think like humans do, but do feel as though they sense things better than humans. Geese mate for life.” Her brother’s dog knows exactly when they return or when a storm is brewing. Insects can sense food is nearby. My husband mentioned that elephants must trust their trainers. Dame Daphne Sheldrick knows this first-hand. Head of Wildlife Trust, she saves Africa’s orphaned elephant babies. Baby elephants need their mother’s milk for normally the first three years of their life. Workers at her organization, take over this role – feeding the babies. I feel that bugs and animals, can sense positive and negative energy and get a reading or a vibe from humans. A sort of universality beauty, as Ralph Waldo Emerson once said in his ninth essay “The Oversoul.” A oneness. Every living thing is somehow connected to every other living thing. I’ve rescued a butterfly stranded on a gas station pump. At first glance, it seemed as if the butterfly was in the last stages of life. At closer inspection, its wing was inverted (out of place). I helped the little guy out, moved the wing back to its proper position and watched it flutter off. Found in the tall grass at my previous home, I’ve taken newborn bunnies to the vet in hopes of finding them homes. This seemed more important than getting to work on time. When our dog Mitch ripped three layers of skin open on a rusty horseshoe spike and within ½ inch of severing a major artery, I applied pressure on the wound while my ex drove recklessly to an animal emergency clinic to save his life. As a child, I’ve nursed baby birds back to health when they’d fallen out of their nests. Over the last few years, my husband and I have offered up our land as a wild animal release site for baby animals such as squirrels, opossums and rabbits. While scubadiving, we’ve cut fish lines saving rope corals and sea fans from suffocation. On countless roads and thoroughfares, we’ve stopped our car to move turtles (of all sizes) out of harm’s way. We’ve provided safe, secure homes to many animal children over the years – cats and dogs that might otherwise have been neglected, put to sleep, or abandoned. I suppose you could say they’ve trusted us. Recent brushes with nature in the last few weeks include: a dragonfly perching on my husband’s fingertip while on a canal tour in Sturgeon Bay; a damselfly lighting on my forearm while floating down the Lazy River at Raging Rivers Water Park; and a butterfly landing on my big toe while relaxing on our deck chairs. Let me be completely honest. The chalky ice-blue Spreadwing damselfly with wings so transparent and eyes deep blue and large, was enough to mesmerize while observing its raw beauty. To others around me (except hubby, of course), I must have looked funny (strange) as I asked the question “How are you doing little one?” of the damselfly, while floating around in a big fat innertube. I chuckled with delight and thanked God the damselfly chose an appreciative human with which to interact. So for me, I suppose bugs (and animals) do trust, in some weird cosmic way. 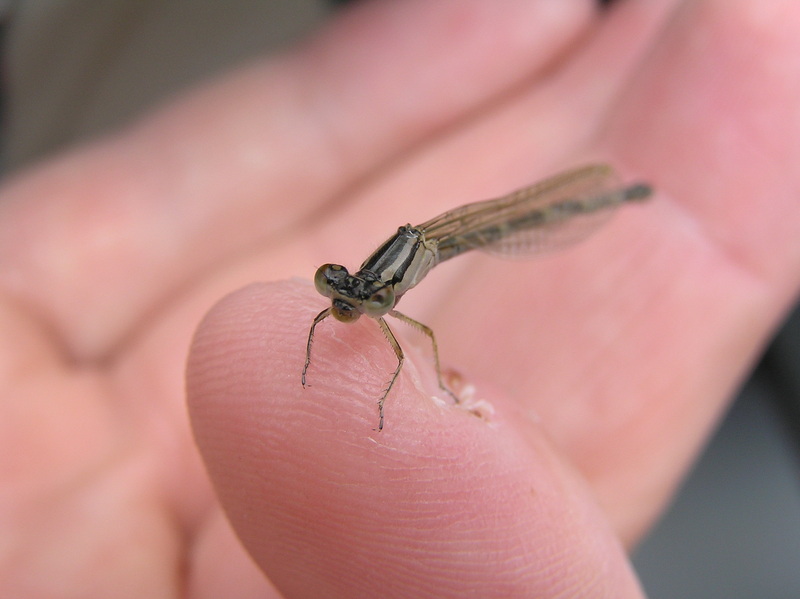 Whether my sweet damselfly realized it or not, she put her precious (and short) life in my hands. I reciprocated, if just for a minute, by pouring out positive energy – a goofy smiling face and some good old-fashioned universal love.